Buying a camera in Hong Kong remains popular with overseas tourists from the United Kingdom and the United States. In truth, the rock-bottom deals that gained Hong Kong a reputation for cheap cameras are long gone, but you can still find models at lower prices than at home. The selection of cameras, lenses, and other photography gear is also excellent. Read on to find out about where to buy and the scams to look out for. Absolutely, but the bargains aren’t as deep or as easy to find as they once were. Whether buying a camera in Hong Kong is cheaper than in your home country will mostly depend on what type of camera you want to buy. Those looking to pick up a cheapish, brand-name digital camera are likely to find prices very similar to online retailers in the United States and the United Kingdom. Hong Kong does have some very cheap, knock-off digital cameras that you’ll pay no more than a handful of dollars for—think Nikon and Pentax. The catch is that they’re unlikely to last more than a few months and occupy a legal gray area. The best value is in truly top end cameras—think DSLRs and bridge cameras. There is a thriving market for these pricey models, lenses, and other accessories. The competition is keen, and with retailers in cut-throat competition, there are significant savings to be made. Bargain hunters will always recommend Hong Kong’s independent camera stores. You'll see them plastered with neon Canon and Nikon signs and have stacks of cameras in the window. Unfortunately, many of these are complete tourist traps—especially those in and around Nathan Road in Tsim Sha Tsui. Hong Kong’s independent camera shops are not, as a rule, a good place to seek advice on purchases as the seller will likely recommend the stock he or she wants to shift rather than the camera you really need. And, while scams and cons are not as widespread in Hong Kong as rumors suggest, they do happen (and they happen more frequently with camera purchases). Skip the tourist trap shops, however, and you'll find some of the best independent retailers of cameras in the world. Many of the shops are family-owned and run by families who have been in the business for decades. 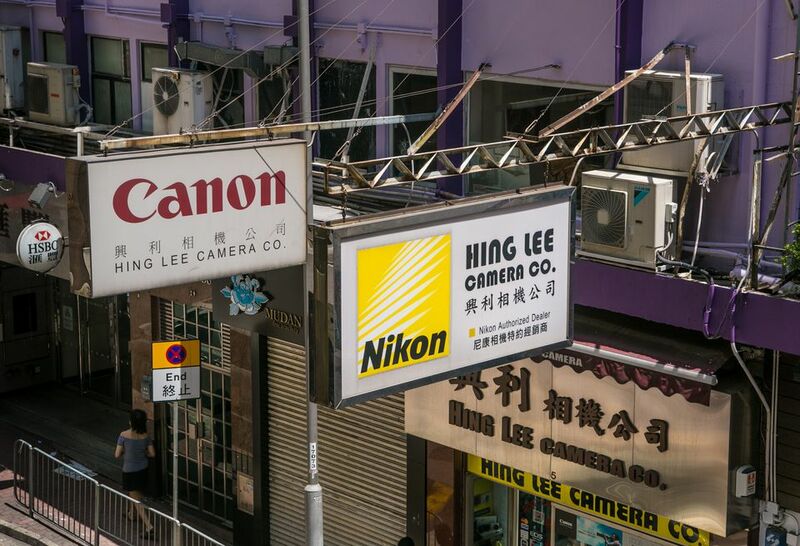 Stanley Street on Hong Kong Island has a number of well-regarded independent, camera shops while Tin Cheung Camera is regularly lauded for its selection and service. For cheaper prices, head to the Sim City mall (Shantung Street) in Mong Kok. The shops and small kiosks here don't offer great customer service, but they happen to do great camera prices. You should do your research and know what you want in a camera. Research the price in your home country and in reputable chain stores in Hong Kong such as Broadway and Fortress. This will put you in a good position to negotiate a sensible price. Remember, if you’re buying an electronic product in Hong Kong, it’s unlikely that the manufacturer's warranty will be valid in your home country. If you have a problem or a fault, you’ll be on your own. Keep in mind that the plugs on Hong Kong products are the three-pronged British type. Some products won’t even have a warranty in Hong Kong. Many of the products sold in Hong Kong are not directly stocked from the manufacturer. Known as parallel or gray imports, these products don’t have any warranty or manufacturer support.